Earlier this week, The Intercept published a 166-page document outlining the government's guidelines for placing people on an expansive network of terror watch lists, including the no-fly list. In their report, Jeremy Scahill and Ryan Devereaux highlighted the extremely vague and loosely defined criteria developed by 19 federal agencies, supposedly to fight terrorism. Using these criteria, government officials have secretly characterized an unknown number of individuals as threats or potential threats to national security. In 2013 alone, 468,749 watch-list nominations were submitted to the National Counterterrorism Center. It rejected only 1 percent of the recommendations. Critics say the system is bloated and imprecise, needlessly sweeping up thousands of people while simultaneously failing to catch legitimate threats, like Boston Marathon bomber Tamerlan Tsarnaev. 1. You could raise "reasonable suspicion" that you're involved in terrorism. "Irrefutable evidence or concrete facts" are not required. This guidance addresses how to place people in the broader Terrorist Screening Database (TSDB), of which the no-fly list and the selectee lists -- which cover those selected for enhanced screenings before boarding flights -- are both subsections. In determining whether a suspicion about you is "reasonable," a "nominator" must "rely upon articulable intelligence or information which, taken together with rational inferences from those facts," can link you to possible terrorism. As Scahill and Devereaux noted, words like "reasonable," "articulable" and "rational" are not expressly defined. While the document outlines the need for an "objective factual basis," the next section clarifies that "irrefutable evidence or concrete facts are not necessary" to make a final determination as to whether a suspicion is "reasonable." So how could intelligence officials be led to put you on the watch list? 2. You could post something on Facebook or Twitter that raises "reasonable suspicion." According to the document, "postings on social media sites ... should not be discounted merely because of the manner in which it was received." Instead, those investigating the individual should "evaluate the credibility of the source" and, if they judge the content to pose a "reasonable suspicion" of a link to terrorism, nominate the person to the watch list, even if that source is "uncorroborated." If this sounds disturbing, don't worry: There's a sentence that explicitly prohibits listing an individual "for engaging solely in constitutionally protected activities." So as long as your free speech isn't accompanied by any other "suspicious" behavior, you should be fine, maybe. 3. Or somebody else could just think you're a potential terror threat. The guidelines also consider the use of "walk-in" or "write-in" information about potential candidates for the watch list. Nominators are encouraged not to dismiss such tips and, after evaluating "the credibility of the source," could opt to nominate you to the watch list. 4. 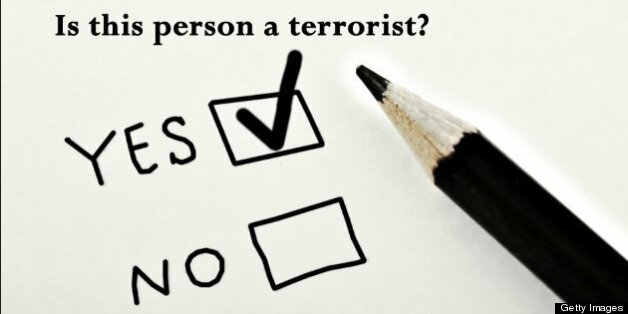 You could be a little terrorist-ish, at least according to someone. The document explains that you could be put on a suspected-terrorist watch list if you are determined to be a "representative" of a terrorist group, even if you have "neither membership in nor association with the organization." Individuals accused of being involved with a terrorist organization, but who later are acquitted in a court of law or saw their charges dropped, are still potential nominees for watch-listing, so long as "reasonable suspicion" is established. 5. Or you could just know someone terrorist-y, maybe. Scahill and Devereaux reported that the immediate family of a suspected terrorist -- including spouse, children, parents and siblings -- may be added to the Terrorist Identities Datamart Environment (TIDE), a broad terror database that feeds into the TSDB, "without any suspicion that they themselves are engaged in terrorist activity." According to the document, "associates or affiliates" of known or suspected terrorists, or just those somehow "linked to" them, can also be nominated to the TSDB watchlist, so long as the relationship is defined and constitutes a "reasonable suspicion" of a connection to terrorist activity. The document states that "individuals who merely 'may be' members, associates or affiliates of a terrorist organization" may not be put into the latter database, unless that suspicion can be backed by "derogatory information." But there's also a more nebulous connection that could prompt your placement in the TIDE database. The document specifically provides for nominating "individuals with a possible nexus to terrorism ... but for whom additional derogatory information is needed to meet the reasonable suspicion standard." 6. And if you're in a "category" of people determined to be a threat, your threat status could be "upgraded" at the snap of a finger. The watch-list guidelines explain a process by which the assistant to the president for homeland security and counterterrorism can move an entire "category of individuals" to an elevated threat status. It's unclear exactly how these categories are defined, but according to the document, there must be "current and credible intelligence information" suggesting that the group is a particular threat to conduct a terrorist act. Such determinations can be implemented and remain in place for up to 72 hours before a committee convenes to decide whether the watch-list upgrade should be extended. 7. Finally, you could just be unlucky. The process of adding people to the terror watch lists is as imperfect as the intelligence officials tasked with doing so. There have been reports of "false positives," or instances in which an innocent passenger has been subject to treatment under a no-fly or selectee list because his or her name was similar to that of another individual. In one highly publicized incident in 2005, a 4-year-old boy was nearly barred from boarding a plane to visit his grandmother. The watch-list guidance was supposedly revised in part to prevent incidents like these, but with more than 1.5 million people added to the lists in the last five years, mistakes are always inevitable. Just ask Rahinah Ibrahim, a Stanford University student who ended up on a no-fly list in 2004 after an FBI agent accidentally checked the wrong box on a form. But then if you were to be mistakenly added to a list, you probably wouldn't know -- unless it stopped you from flying. The government has been extremely secretive about the names on the various watch lists. If you were to learn that you were wrongly placed on a watch list, good luck getting off it. As Scahill and Devereaux reported, you can file a complaint with the Department of Homeland Security's Traveler Redress Inquiry Program, which begins a review "that is not subject to oversight by any court or entity outside the counterterrorism community." And if you were to get your name removed from the watch list, the intelligence agencies aren't even obligated to inform you of your updated status. Helpful. The secretive nature of the terror watch lists has come under court scrutiny recently. A federal judge ruled in June that the government must develop a new process under which individuals can challenge their inclusion on the no-fly list. The judge found the current process "wholly ineffective."